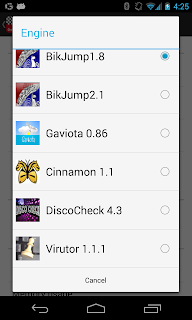 More engines were added to the Chessbase compatible engines for Android package. Many thanks to the engine authors for their explicit permission. I am about to release a next version of Chess for Android that recognizes engines in the Chessbase compatible format discussed in the previous blog posting. The new version is available as direct download or from Google Play. With this release, all engines installed in this format (either the engines that ship with the Chessbase for Android application itself, or engines installed in this format, such as my own Engines.apk package) are available for direct import in Chess for Android as well as in the latest Chessbase for Android. Together with sharing capabilities, this greatly enhances the 'chess ecosystem' on Android, since chess GUIs can now be used interchangeably in a much simpler manner. As before, engines authors that want to be included in the package can drop me an email. Chessbase announced UCI engine support in Chessbase for Android too. Great news! I have packaged some chess engines in Chessbase compatible format so that they are directly available in that application. I will also release a new version of Chess for Android that supports this format to keep the chess ecosystem complete. Simply download and install my Chess Engines Package, available at Google Play. For now, the package only contains a few engines, but any chess author that wants to be included is welcome to drop me an email with permission to include the binary in the application.